Rain Transfers is the leading provider of airport transfers and private transfers since 2000. 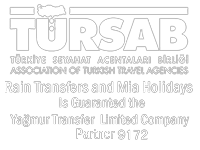 We are one of the known company of the transfers and accommodation and representative services, serving mainly the Aegean coast of Turkey, All Turkey Area And All Over The World. We provide the highest level of service at great value-for-money prices. We offer both shuttle services and private transfers to meet the demand and individual requirements of our customers. Providing we operate through a specific gateway and offer the type and size of vehicle for the service required, we can arrange a transfer to any destination. We keep our transfers as economical for our customers as possible and achieve this by using all our own vehicles and drivers to keep costs down. We have own our taxis and minibusses. We have an excellent local knowledge, 24 hour emergency helpline and fully English speaking staff. We have professional teams in our company , we give excellent service for our customers. Our company first aim is our customers happiness in the Worldwide with excellent services. We have full public liability insurances for our customers safety. Shuttles are shared services that we operate between the main gateways and official tourist accommodation in the most popular holiday destinations. Customers pay for a seat in a vehicle that they share with others travelling to the same destination or to various destinations on the same route. Private transfers operate according to the individual requirements of the customer who pays for the vehicle to transfer them to their specified destination. Vehicles may be any type and size, depending on the number of people in a party. We cater for individual travellers, as well as for groups. Our transfers will drop customers directly at their door, even at private accommodation or villas and our private transfers can be arranged to meet a customer specific needs.